The first thing I would like to share with you is "We do not learn technologies, we learn how to use technologies for our business". Checkout the code at https://github.com/techcoaching/TinyERP.git. List out the steps we need to do to complete the page. Figure out the missing information, so we can ask for help immediately. Think about the flow of logic from the client to server side, from UI to repository. So the written code will be nicer. For this, many of my co-workers try to write the code first, and debug it later. When something goes wrong, it changes our behavior, and we try to change the code to make it work. This may break the logic flow and the code does not follow the convention. The architecture was used in the app. This will raise some new potential issues in the future and the code is hard for maintenance. Implement logic of "Add Role" component. Implement service for this page (service will make the call to REST API for creating/ updating data on server). Implement service for this page (service will make the call to REST API for creating data on server). 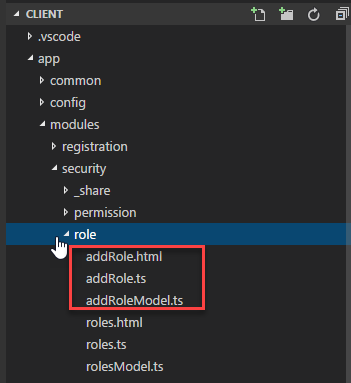 Add new method into RolesController for handling create request related to Role. Add new method into IRoleService and RoleService for creating Role. User creates new Role calling Create method of Role repository. In the UnitOfWork, we specify explicitly the mode we want to use for this UnitOfWork. This avoids unexpected change from being saved to database. "security.addOrUpdateRole.validation.nameIsRequire", this will be resolved on client base on current language and display the error as the tooltip on each form component. In my code, the service should only return client the key of error, and client will display in appropriated language itself. IRoleRepository and RoleRepository for creating Role. We do not need to change this repository as it inherited appropriate method from IBaseContentRepository and BaseContentRepository. Until this point, we can create new Role using the code. Hi. Cool post. There�s an issue with your site in chrome, and you may want to test this� The browser is the marketplace chief and a good element of people will omit your excellent writing because of this problem.